News from LMCU: Prime Platinum named Best Low-Fee Credit Card by Kiplinger Magazine! Prime Platinum named Best Low-Fee Credit Card by Kiplinger Magazine! 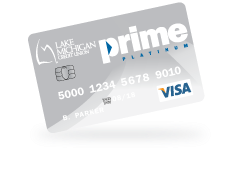 Lake Michigan Credit Union’s Prime Platinum Visa card recently got the attention of Kiplinger Magazine. This highly regarded financial publication rated our Prime Platinum card the Best Low-Fee Credit Card in the country! Designed for members who tend to carry a balance from month to month, Prime Platinum’s rate is as low as Prime plus 3.00% APR*, is tiered, linked to Prime and has no balance transfer fees! That makes it perfect for paying off high-rate credit cards with no annual fees. It’s no wonder Kiplinger noticed! Apply for yours today by calling (800) 242-9790 ext. 9944, visit any branch or go to LMCU.org to get started. *APR = Annual Percentage Rate. Rate is variable, tied to the Prime Rate and based on credit qualification.